Fungicide » Insignia » FU430171 - Surf the Turf! Controls key turf diseases for up to 28 days. Delivers better control of the top 5 diseases than Heritage. Suppresses dollar spot. Pyraclostrobin, the active ingredient in Insignia, is an exciting kind of strobilurin chemistry. It is locally systemic, moving both upward and downward to a limited degree, to protect unsprayed portions of the leaf. In addition, pyraclostrobin will move from the top to the bottom of the leaf (translaminar movement), so Insignia applied to the top of the foliage will give protection to the underside as well. Because Insignia controls such a broad spectrum of diseases for such an extended period, it's the perfect foundation product for your fungicide spraying program. As with all fungicide chemistries, Insignia should be applied as part of a rotation. 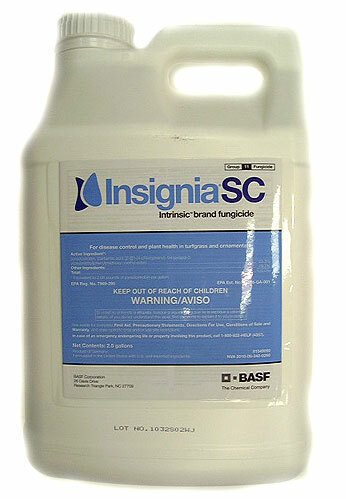 Insignia can be tank-mixed with other fungicides for additional disease control. To achieve optimal results, make no more than two successive applications of Insignia. For specific application rates and instructions, consult the product label. Application rate: .4 to .7 oz. per 1,000 sq. ft. or 17.4 oz. to 30.5 oz. per acre. Notify me of updates to Insignia Sc Int. (2.5 Gal)2/Cs.